2019 Holland Michigan Tulip Festival! 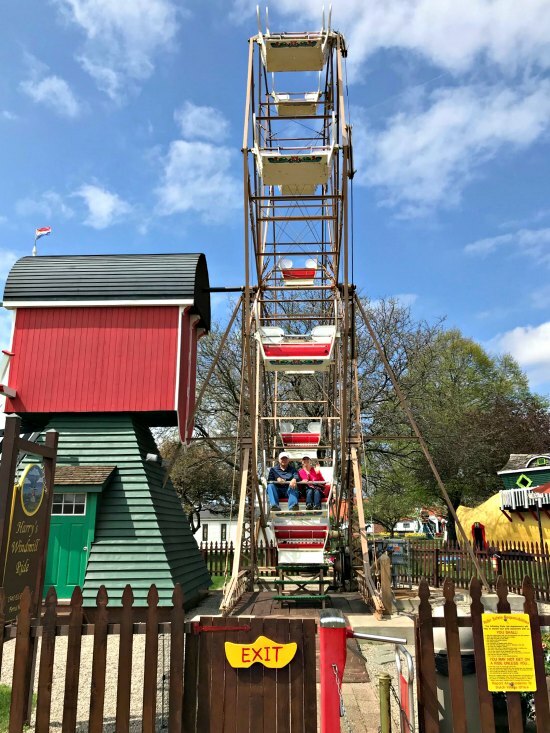 The 2019 Holland Michigan Tulip Festival, known as Tulip Time, is a super popular festival held the first and second weekends in May. 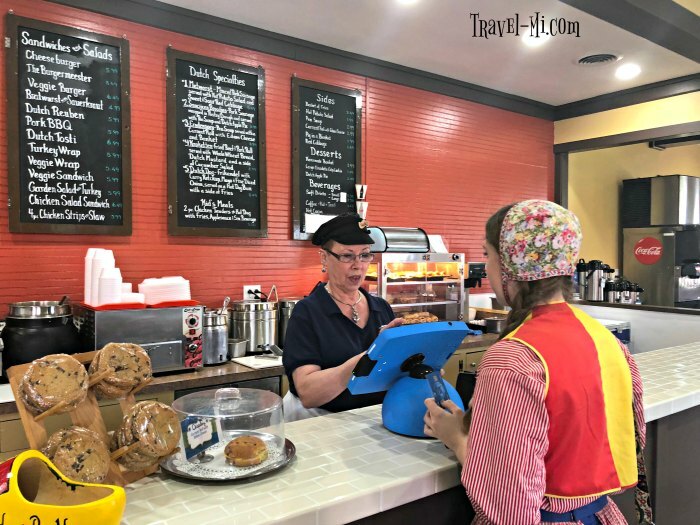 Plan your visit with 2019 Tulip Time maps, events schedule, tips and the ever popular tulip tracker! This outstanding family friendly festival is an explosion of color, sights, sounds and experiences. I am always GIDDY by March for this festival to begin! 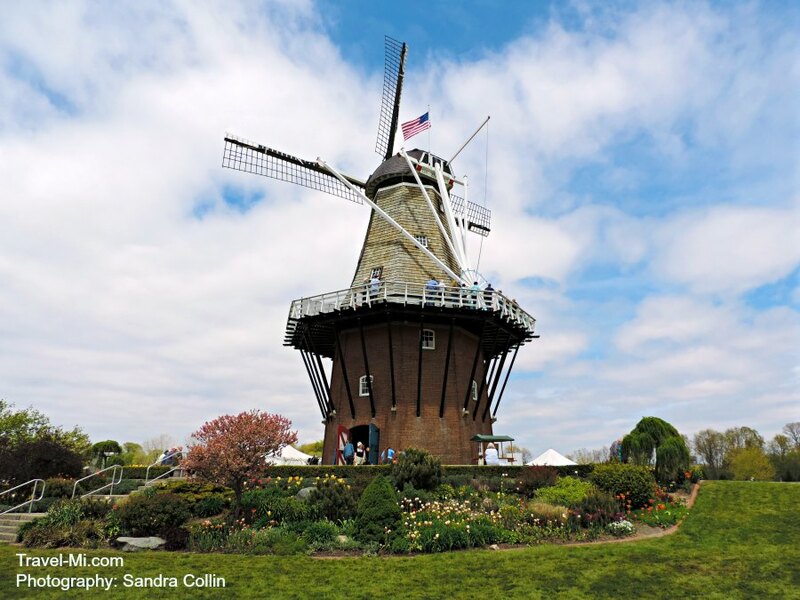 Excited for 2019 Holland Tulip Time Festival? It's Sat, May 4, 2019 – Sun, May 12, 2019. 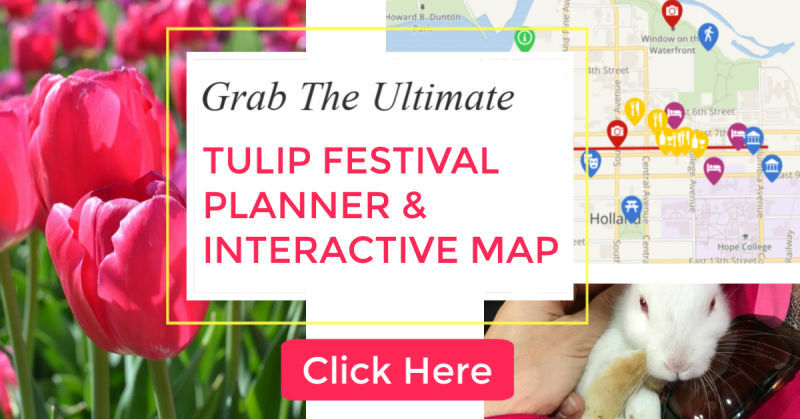 Grab Our Ultimate Interactive Tulip Time Map & Planner! Click here for the Ultimate Interactive Tulip Time Map! Did you know there is a Holland Tulip Tracker? WHATTT? How cool is that? Watch the colorful tulips as emerge from the ground and begin to grow in Centennial Park. It's so exciting to track their progress as it gets closer and closer to Tulip Time by clicking here!! 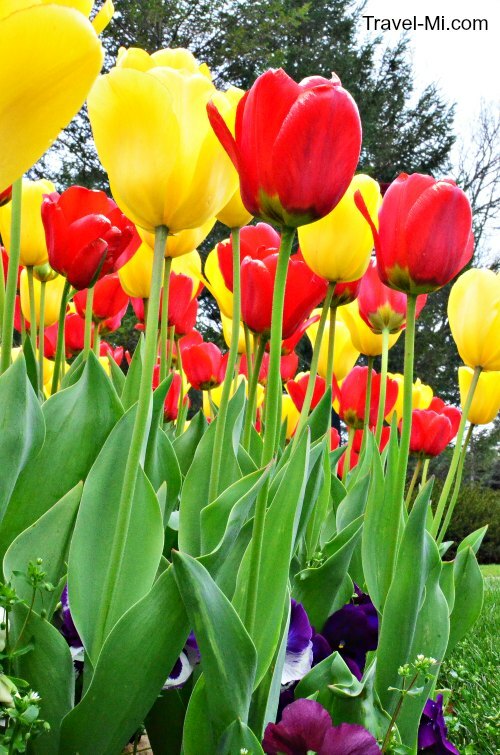 Tip: Check the Tulip Tracker to make sure the flowers are at a perfect bloom for your photos! You'll Fall in Love With Holland in One of Our Favorite Convenient Hotel Locations! The rooms available for booking stays in Holland Hotels are very limited but you can stay in outlying areas. For example we have stayed in Grand Rapids and Drove to Holland. Its not a bad drive but it doesn't get you in the action. 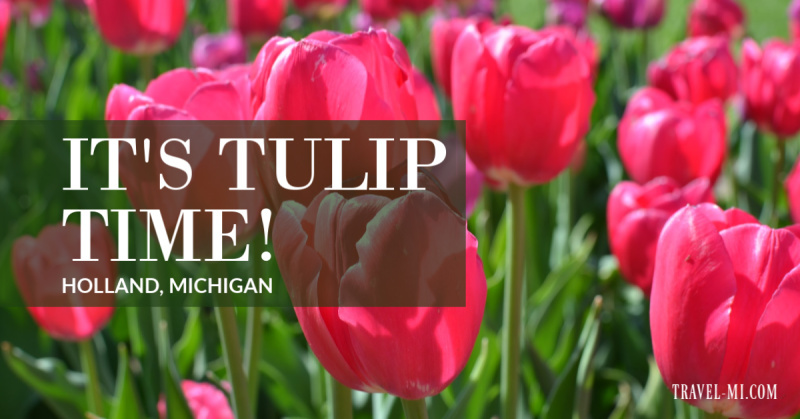 If you want to immerse yourself in the Holland Tulip Time Spirit we suggest staying in a vacation rental property. Many owners offer up their homes for stays during this festive time of year. 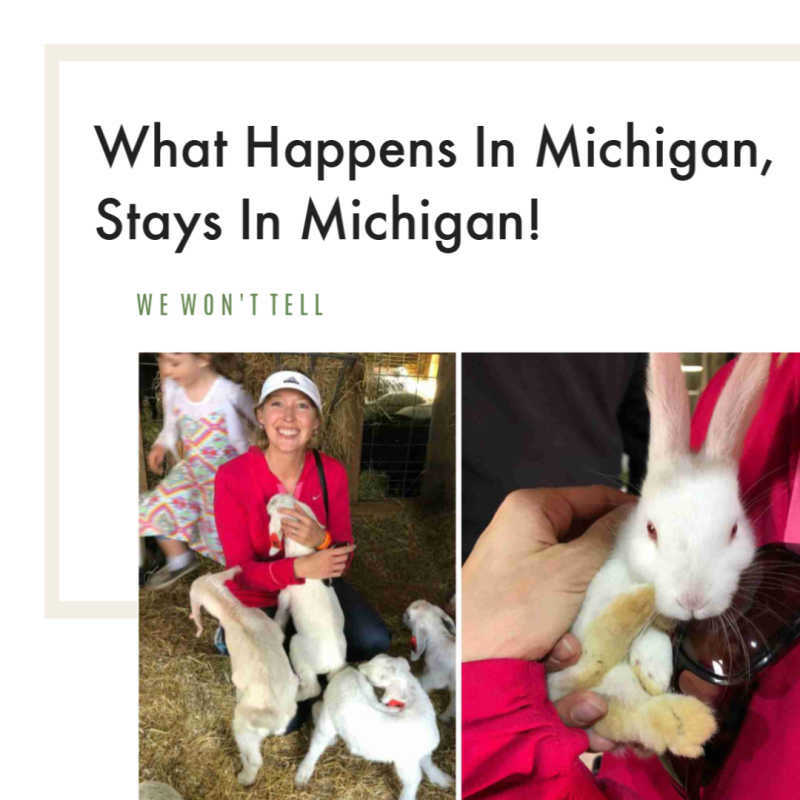 To see and live like Holland Michiganders research your Holland Michigan Vacation home stay. 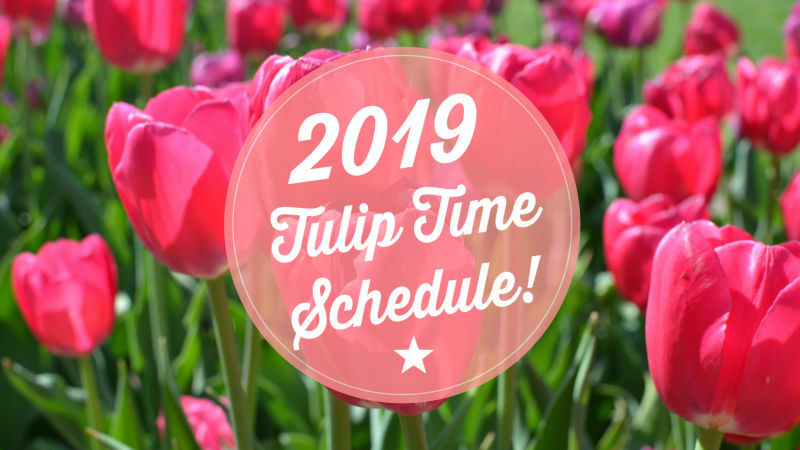 Grab the 2019 Holland Michigan Tulip Festival Schedule! Plan ahead to make the most of Tulip Time as there are so many events, shows, tours and things to do! 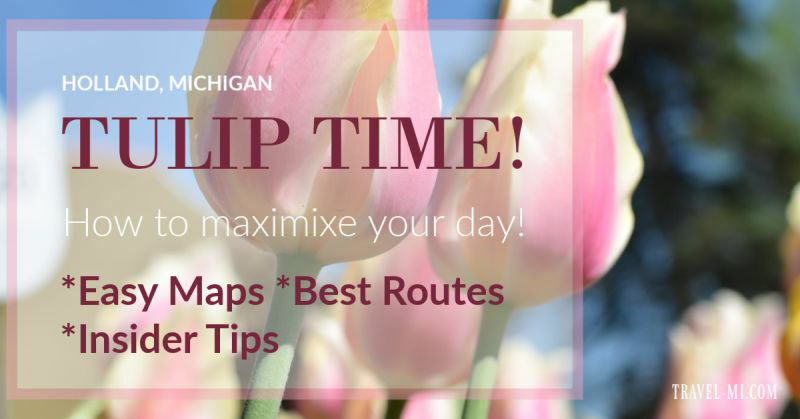 Maximize your day with our easy to follow Tulip Time map! Quickly plan what you want to see in the most logical order. Did you know? 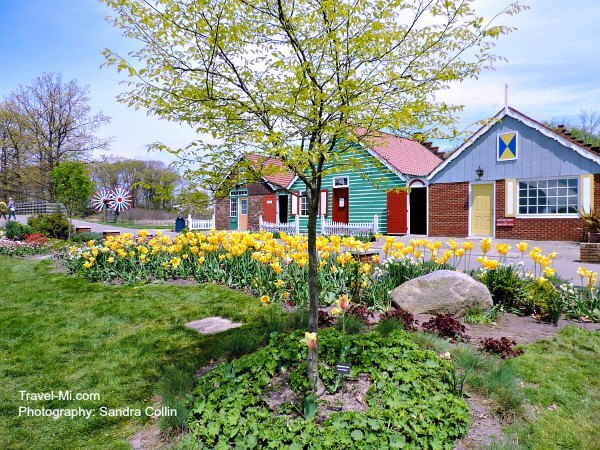 Each fall, the City of Holland Parks Department plants around 316,000 tulip bulbs in their city parks and along the Tulip Lanes in anticipation for the Holland Michigan Tulip Festival! 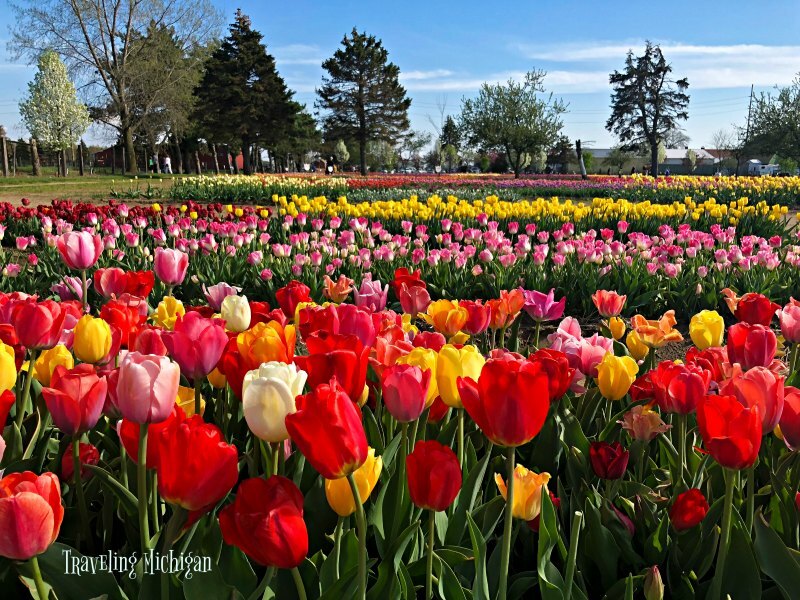 Tulip City Tours (Classic Or Plus)-Enjoy a guided Tulip City Tour in mini coaches or trolleys to experience an overview of the gorgeous tulips during Tulip Time! To purchase tickets, visit the blue ticket booth located at Window on the Waterfront, at the corner of 6th Street and College Avenue at 61 E. 6th Street. Tulip City Tour tickets can only be purchased for the current day’s tours at the on-site blue ticket booth from 8:30 am – 5:00 pm or until sold out each day. 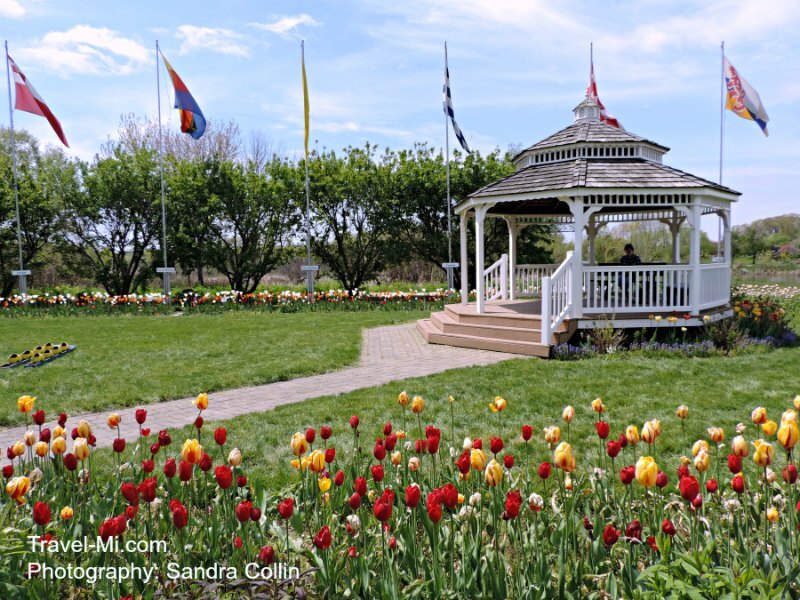 PLUS Tour Option-Narrated tour of Tulip Lanes, Holland’s Historic District, city parks, with on/ off privileges with admission to Windmill Island Gardens, Holland Museum and Cappon & Settlers House. This tour is not available on parade days. Last pickup is at Windmill Island Gardens at 5:45 p.m.
Classic Tour-hour long narrated tour without on/off privileges. Experience Tulip Lanes, Holland’s Historic District, city parks, and the beautiful downtown area. For more information on both tours, click here! Celebrating our Mothers on Mother's Day at the Holland Michigan Tulip Festival! Centennial Park, 250 Central Ave, Holland, MI 49423. Moederdag Market (Dutch for Mother’s Day Market) features special merchants, live performances, demonstrations, gourmet food trucks and horse-drawn carriage rides. 12755 Quincy St, Holland, MI 49424. Oh my, what can I say about this place but WOW!! My parents and I LOVE coming here to take photos. It's so peaceful to wander down the rows appreciating the beauty of nature. My mother's photo above, shows the exquisite rainbow of color showcased at this gorgeous tulip farm! History: In 1950 Vern Veldheer started a hobby farm with only 100 red tulips and 300 white tulips. Today, Veldheers plants over 5.5 million tulips! Perennials and flowers are brought in from around the world and are available for purchase. Visiting: Veldheer's recommend visiting their colorful spring gardens during the last week in April until the middle of May. There is an admission fee of around $10 for adults, $5 for kids. Admission is free to visit the Wooden Shoe Factory & Delft Factory to see how dutch pottery is made. What is the Delft Factory? It's Dutch pottery that takes almost a full week to produce! They are the only production facility in North America, offering over 400 different hand painted Dutch pottery pieces. Don't miss seeing the pouring and firing process. The cool part (for me anyway) is getting a chance to speak with the artists as they hand paint the Dutch designs. I love the up-close-and-personal experiences! Parking: They have significant paved parking close to the main building and tulip farm. There is also parking in a non-paved lot nearby. Restrooms are porta johns only. There are no flushing toilets or indoor restrooms available. Food: The main building sells bread, snacks and other specialty items. No main meals. 1 Lincoln Avenue, Holland MI 49423. Windmill Garden opens to the public in mid April. There is a charge to enter the garden, even during Tulip Time. 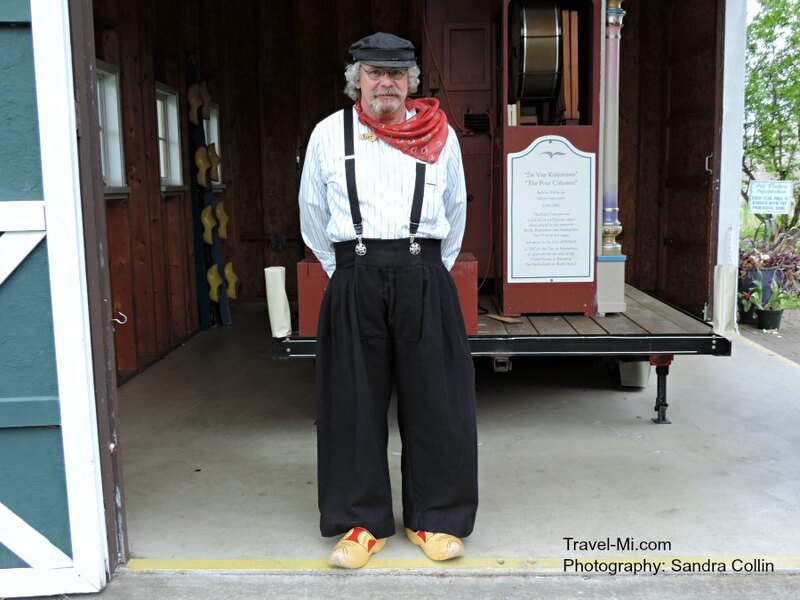 I just love exploring this beautiful island and touring the windmill during the Holland Michigan Tulip Festival. There are such great photographic opportunities also. Food on the island includes a bakehouse and deli. During Tulip Time, food trucks are generally available for tasty meal options. Pet Friendly: Pets are allowed with the exclusion of the windmill and gift shop due to food processing. Pets will need to be leashed & picked-up after. So this is cool....The Four Columns is an organ that was played in the streets of Breda, Rotterdam and Amsterdam. It was given to the City of Holland in 1947 by the City of Amsterdam in gratitude for the United Stated in liberating The Netherlands in WW2. 12350 James St, Holland, MI 49424. Let me just say, we have a great time at Nelis' Dutch Village. The photography is spectacular during the Holland Michigan Tulip Festival! Great place to visit for both adults and kids! 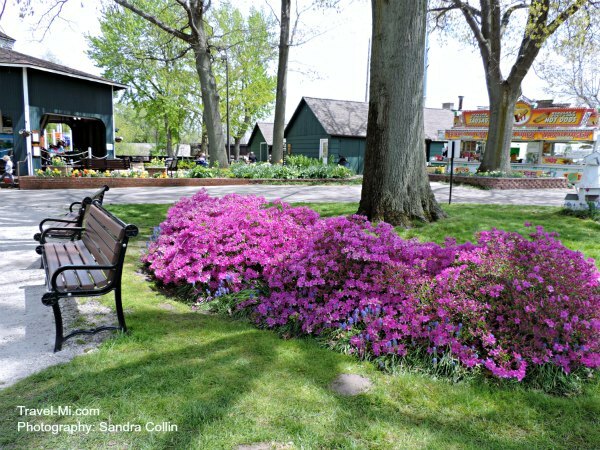 The park is open all season so be sure to visit beyond Tulip Time. Upon arriving, you will be wowed by the spectacular display of color with the buildings and the pretty canal. Tiny baby ducks were bobbing in the water when we were there. So cute! Grab a schedule at the entrance for interactive dancing and begin by wandering through the numerous shops. Stop by the Dutch shoe production area, candy shops and candles stores. Hungry? Stop at the Hungry Dutchman Cafe for American and Dutch cuisine. Since I ADORE Fuzzy baby animals, I LOVED the petting barn. The goats were a little over a week old and they sure loved attention. 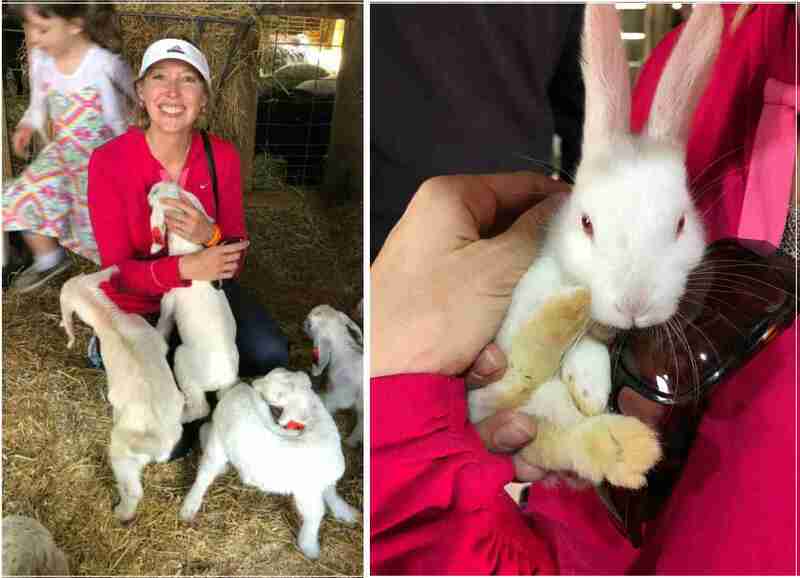 "My" white baby bunny was so soft and calm, I would have loved carrying it around the rest of the afternoon! There are lots of photo opportunities as everything in the village is so colorful. We enjoyed riding an old Ferris Wheel (well, I was a little tense...) and there were other rides to check out too. Nelis' Dutch village has lots of benches, shade trees and restrooms. It's a nice way to spend a couple hours during the Holland Michigan Tulip Festival! 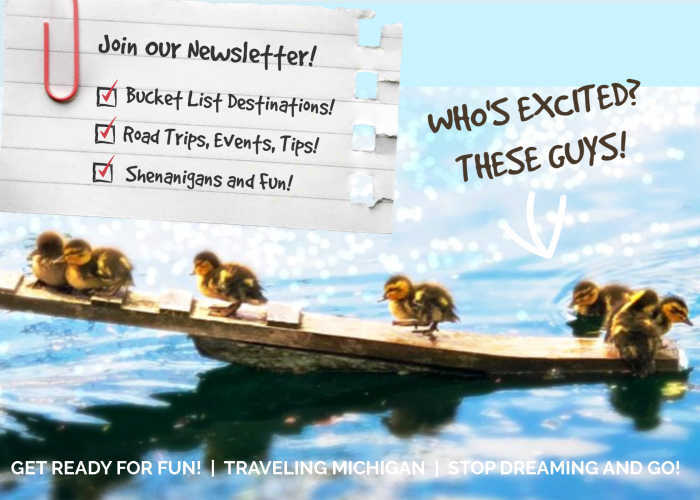 Do you have a great story, tip or suggestion of great things to do in Holland? Share it!